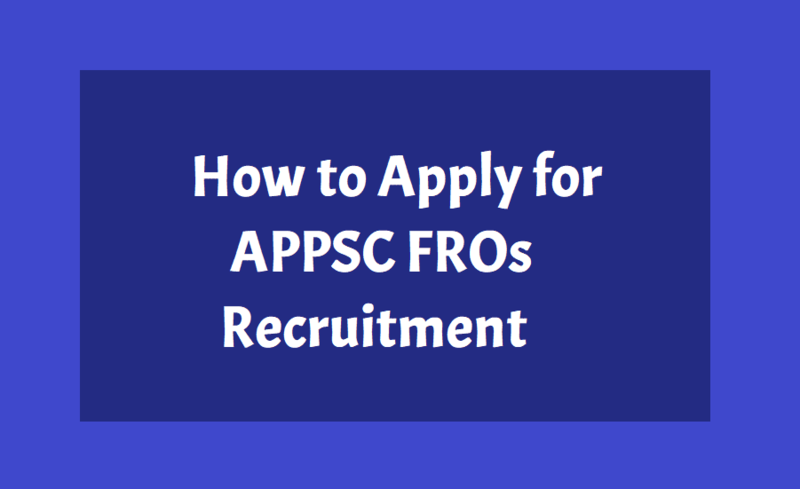 How to apply for APPSC Forest Range Officers Recruitment 2018: APPSC recruitment 2018 Applications for Forest Range Officer posts to begin on December 10. The Andhra Pradesh Public Service Commission (APPSC), on Wednesday, released notification to fill 24 posts of Forest Range Officers. The candidates are asked to apply online from December 10 to 31. Andhra Pradesh Public Service Commission (APPSC) has begun the application process for recruitment of Forest Range Officers in Andhra Pradesh Forest Services. The Commission had advertised 24 vacancies out of which 20 were fresh vacancies and 4 were carry over vacancies. The online application process which has begun from December 10 will end on December 30, 2018 midnight. In order to apply online for this recruitment, candidates would first need to obtain One Time Profile Registration (OTPR) id. Candidates can find OTPR registration link on the homepage of the commission's official website. The Commission conducts Screening test on 24/02/2019. The main examination in online mode for candidates selected in screening test will be held through computer based test on 28/04/2019, 29/04/2019 and 30/04/2019. There would be objective type questions which are to be answered on computer system. However, the reservation categories of candidates are exempted from payment of examination fee Rs.120/- only. A. The Commission is not responsible, for any omissions by the applicant in bio-data particulars while submitting the application form online. The applicants are therefore, advised to strictly follow the instructions given in the user guide before submitting the application. B. All the candidates are requested to submit their application with correct data. It is noticed that some of the candidates are requesting for change in the data, after submission of the application. It is informed that such requests shall be allowed on payment of Rs.100/- (Rupees hundred only) for each correction. However changes are not allowed for name, fee and age relaxation. No manual application for corrections shall be entertained. No changes will be allowed after 7 days of last date of applications. C. The particulars furnished by the applicant in the application form will be taken as final. Candidates should, therefore, be very careful in uploading / submitting the application form online. D. Incomplete/incorrect application form will be summarily rejected. The information if any furnished by the candidate subsequently will not be entertained by the Commission under any circumstances. Applicants should be careful in filling-up the application form and submission. If any lapse is detected during the scrutiny, the candidature will be rejected even though he/she comes to the final stage of recruitment process or even at a later stage and also liable for punishment as per Para 16.1 of this notification. E. Before uploading/submission application form, the candidates should carefully ensure his/her eligibility for this examination. No relevant column of the application form should be left blank; otherwise application form will not be accepted.